“I had just about started to believe that my family was going to be complete. He was doing well initially. It could happen to anyone! Why my child? Why us?" Baby Ganesh is only 6-months-old. Born preterm, he spent the first 20 days of his life in the Intensive Care Unit of the hospital. The little fighter made it, and though he weighed only 2 kg when his parents took him home, they were happy their family was now complete. In his 3rd month though, he started turning yellow, and the family’s worst nightmares came true. The threat was not over yet. The Baby’s Digestive System Is Not Completely Developed. It was in his 3rd month, that Baby Ganesh’s eyes started turning yellow. Slowly, his entire face turned yellow, and this made his parents very anxious. They rushed to a local doctor who immediately referred them to the hospital. The baby’s digestive tract had not developed completely, resulting in an anomaly in his bile duct. The little one could not digest his food, and his liver had been severely damaged. 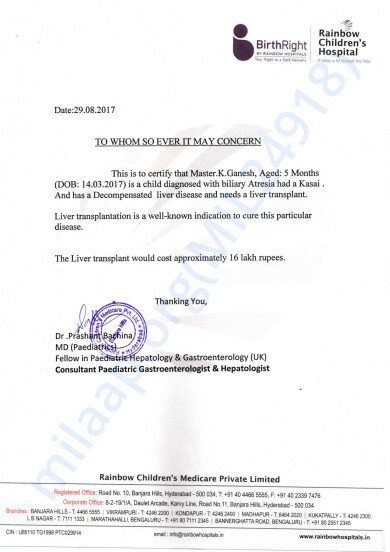 The Baby Needs An Urgent Liver Transplant. The little one’s liver is completely damaged. The only way to save him now is with the help of an urgent transplant. For his father Rajesh, just the solution is not enough. He is willing to give anything he can, but unfortunately that would never be enough to cover the cost of the only treatment that could save his baby’s life. 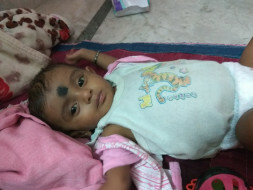 With the help of the hospital, Rajesh is trying to collect the funds he needs to save his baby through this fundraiser. Any contribution made towards this fundraiser will help Rajesh save his baby’s life. Apologies for a delayed update. As of now, Ganesh is doing well and is under medication. His liver transplant is yet to take place because he has lost a lot of weight being under antibiotics. Doctors have suggested a period of three months for him in which he will remain under prescribed medication and after that they will decide a future course of action. We're extremely thankful to each one of you for the love and support which you have shown towards my son. We shall keep you all posted. Thank you for all the love and support you have shown towards my son Ganesh. He is doing better now compared to earlier but it is a long way to go. He is on medication and the doctors suggest that the next course of treatment is going to be a liver transplant. I am trying all the ways possible to raise funds towards his treatment and would request you to please share this campaign further with your friends and family to help me in raising funds faster towards Ganesh's treatment. Please do pray for his health and speedy recovery. Will keep you posted. Thank you for all the support once again.